We had a gray, cold weekend here, but I’m not complaining: that’s the perfect weather to justify spending time in the studio. Accordingly, there’s some progress on which to update you today. First of all, I started the treehouse project! At least, I started the tree. Cold gray weather is not, however, the best for craft photography. It’s already taken on a bit of a haphazard air. My original plan was to build a wire armature and sculpt around it with air-hardening modeling clay, but the only wire I had around was too fine a gauge and (to be perfectly honest) I couldn’t remember where I’d put the clay. So, Friday night I decided to do a test run in papier-mâché. I built an armature from the aforementioned fine wire, slapped on some soggy newspaper, and was pleasantly surprised with the stability of the resulting structure. Of course, the next day I located the modeling clay. Since I found that it had only dried out a little since the last time I used it, I decided to coat the tree with a thin layer of clay to simulate a barky texture before painting. Had I thought through the matter properly, this would probably have been an ideal time to add smaller branches to the boughs, or at least to carve out some supports for the eventual treehouse structure. Oh, well. Making it up as you go is half the fun. 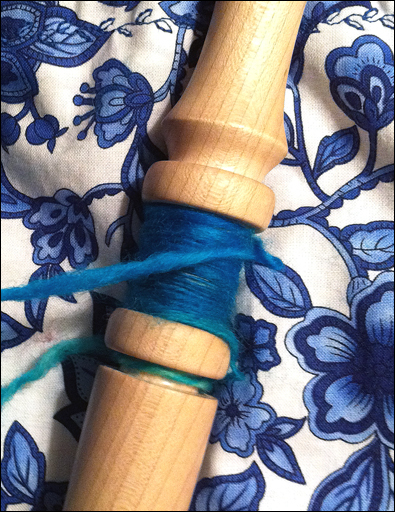 In other project news, I’ve decided to try branching out– somewhat less literally– in my spinning. As I’m told is normal for new spinners, my yarn has been getting finer and finer, not by any conscious decision on my part but thanks to the development of muscle memory. While fine yarns are nice to have around, especially for weaving, I’ve been frustrated by my lack of control over the process. I’ve also wanted to learn more about the ergonomics of spinning. With this in mind, I started reading Respect the Spindle over the weekend. This was cheating a bit—the book was technically assigned to next month’s craft budget*, but the copy I had ordered arrived at my local yarn shop earlier than expected. Much of the material is familiar, but it’s always helpful to see it presented in a new way, and I’ve already picked up some handy tips. 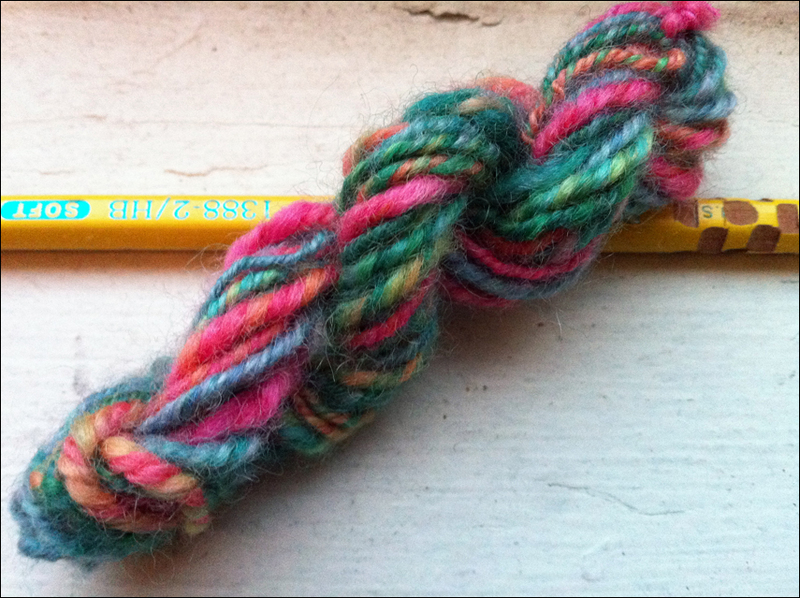 With book in hand, I produced a tiny skeinlet of bulky (well, bulkier) yarn. I also used the Navajo plying technique to keep the colors from getting muddled, something I’d learned about but not mastered in my spinning class. The pencil is for scale. I did not use it to spin. 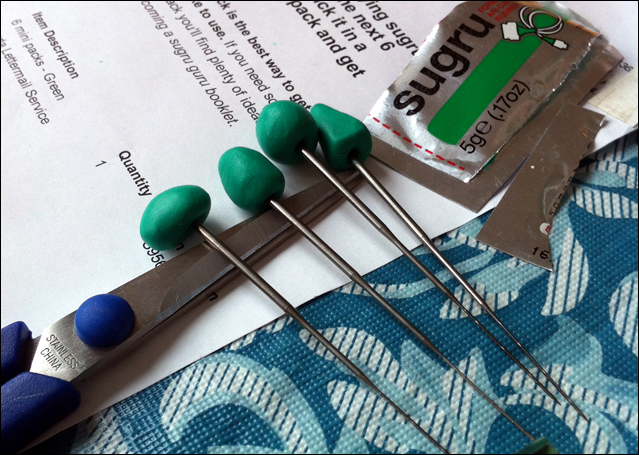 I also dove into some sugru that showed up in the mailbox last week. As a first experiment, I put it to use as grips for my felting needles. Hopefully this will make needle felting more attractive (and preclude the need to spend money on an unaesthetic and junky-looking pink plastic needle holder). I have so many pieces of fluff left over from spinning– it would be a shame to waste it. 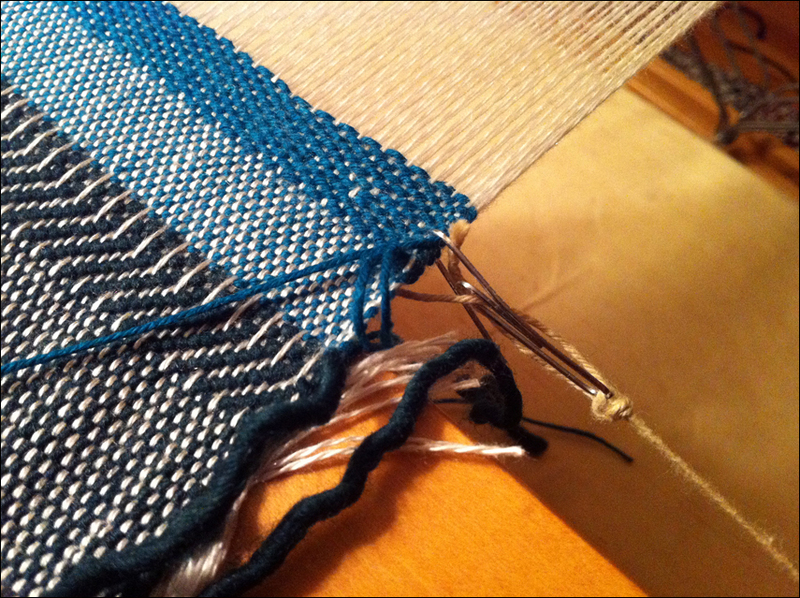 Finally, on the loom, I turned the infamous experimental warp into a doubleweave sample, my first attempt. I’ve only woven a few picks so far—which means about half an inch!—but it is, in fact, two layers of cloth. Incidentally, the green single you see above is from Brown Sheep. My new goal is to emulate it on the spindle! So, after a few weeks of slow progress and false starts, the projects are starting to pile up again. Between the fiber arts and the miniature-making, I should be busy enough for weeks of happy crafting. What’s on your spring to-do list, fellow crafters? *My system for normal months– in which I am not adding to my lap harp collection– is to divide funds more or less evenly between supplies (like yarn, fiber, and glue), tools (like shuttles, spindles, and scissors), and instructional materials (mostly books and the occasional video). Since I started reading this book early, I’ll have to hold off on new reading material until May. That’s where cheating gets you.